Dieting for weight loss often involves consuming foods that are low in fat yet high in protein. Baked beans are an excellent lean protein source and can be used successfully in weight-loss diets. According to the USDA National Nutrient Database, a diet limited only to baked beans has some drawbacks in terms of nutrition, such as not providing you with sufficient daily calcium or vitamins B-12, C, D or E. This diet also may become extremely boring over time. 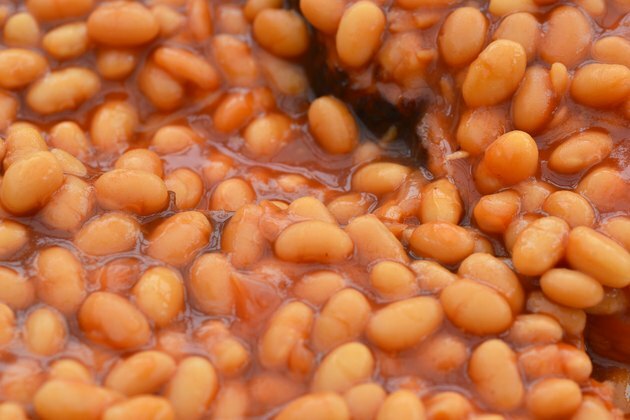 In April 2008, British newspaper "The Sun" reported that a 40-year-old man had devised a diet consisting only of baked beans, and as a result had lost 140 lbs. Neil King ate baked beans at every meal and lost the excess weight over a period of nine months. Additionally, King stopped drinking lager and eating the high-fat foods, which had previously been a significant part of his diet. Baked beans are a relatively healthy food and qualify as one of the recommended five daily portions of fruit and vegetables. One portion of beans for the purpose of five-a-day is 3 heaped tbsp. Beans are a rich source of fiber, protein and other beneficial vitamins and minerals. The protein contained in beans supports healthy functioning of your muscles, body tissues and bones, and additionally contributes to a feeling of satiety or fullness after a meal. Fiber from beans can help lower your cholesterol, reduce problems with bowel function and also regulate blood sugar levels. Beans contain iron, which is helpful in preventing anemia. Beans are notorious for causing flatulence, although King states that this is not a problem once your body adjusts to a baked bean diet. Other considerations concerning the baked bean diet include the amount of sugar and salt contained in a typical can of beans. The United States Department of Agriculture (USDA) reports that a cup of unsalted canned baked beans contains 3 mg of sodium, but commercial baked beans flavored with salt and pork may contain as much as 845 mg of sodium per cup. The Mayo Clinic states that a healthy adult should consume no more than 2,300 mg of sodium daily; this recommended daily limit is reduced to 1,500 mg for those with certain health conditions or risk factors. Following a diet consisting exclusively or primarily of baked beans is unwise in the long term. Your body needs a range of nutrients from different foodstuffs, and limiting your food choices is likely to lead to a shortage of certain nutrients, vitamins or minerals in your diet. You should always consult your doctor before making significant dietary or lifestyle changes.